Every kitchen will always need a mixer grinder that has amazing functionality, durability, and ease of use. That is exactly what Philips Company provides for every home. Philips is a company that has long been in existence and specializes in making electrical appliances. Their mixer grinders stand out for being perfect, exquisite, functional, durable, and more. Because of these, they have received numerous awards, certifications, and international recognition. In every country, you will never fail to hear this brand. It is one of the most trusted brands, and that is why their mixer grinders come highly recommended. 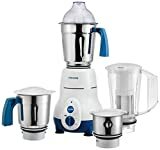 Philips Mixie (HL7810): This item uses 750W of power, and the three jars that accompany it are made from stainless steel material. It has four-speed settings, is smudge resistant, and has an automatic cut off for safety. Philips Viva Collection (HL7699) mixer grinder: This mixer grinder has four-speed setting, is made from high-quality material and is available in white and royal purple. It has three jars and consumes 750W. The motor life is extended and features a gorgeous shoe-shape to occupy less space. Philips HL7720 mixer grinder : It consumes 750 Watts and has three stainless steel jars. It is complete and has a spatula. You can choose between bright white and pistil red. It has four-speed settings and an automatic cut-off for safety. Philips Daily Collection (HL7510) mixer grinder: It uses 500W of power, and it features a perfect Reverse Quadra Flow that helps to keep food from sticking on the sides. Thus, it is easy to clean. It has four-speed settings and an automatic cut off for safety. These are just but a few of the Philips mixer grinders you can try, but there are a lot more options in the market. To give you more options to choose from and help you to pick the best suitable one,here is the best selling Philips brand mixer grinders online in India. You could go through the list and pick one that can best serve your purpose and yet falls with in your budget.